The first time I'd heard about Hampi was in my school history class. 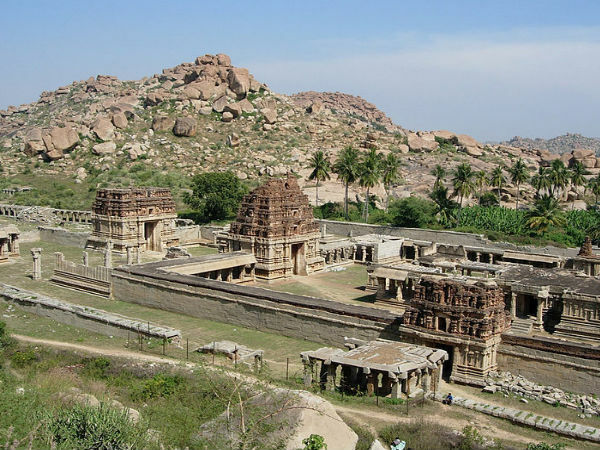 Hampi was the capital city of the erstwhile Vijayanagar Empire, which was ruled by the Sangama dynasty in 1336. It is now a UNESCO World Heritage Site. My fascination with historical places combined with travel stories of friends who've been there, only added to my burning ambition of visiting Hampi. Finally, I got the opportunity when I came across Hampi Utsav, a sound & light cultural fest organized each year, mostly in November. Season-wise, the ideal time to visit Hampi is from September to February. My friends and I planned a 3-day road trip rather than travelling by train or flight as it seemed practical to have a vehicle at our disposal considering Hampi has many tourist attractions. It also gave us the convenience to explore other places of historic importance en route. We carried a printed map of Hampi as well as a soft copy on our phone to guide us. We started early in the morning from Bangalore and took the Tumkuru-Sira-Hiriyur route towards Chitradurga. After driving approximately for 3.5 h to 4 h, we reached Chitradurga. After treating ourselves to a lavish meal and piping hot coffee, we proceeded to explore the attractions at Chitradurga, mainly the Chitradurga Fort. The fort lived up to its reputation of a magnificent ancient edifice. Despite being a hot afternoon, it was cooler on top. The fort has many passages, warehouses and granaries, temples and also a mosque, built by its various rulers. But the most interesting part was the interconnecting water tanks which were probably the earliest rainwater harvesting tanks. It is believed the fort never suffered from water shortage. From here, we made our way towards Obavva Kindi. It's the secret passage in the fort from where Hyder Ali's soldiers were believed to have infiltrated, only to meet a gory end at the hands of the brave lady Obavva. It was amusing to find some tourists get inside the hole to take interesting pictures. After the short break, we resumed our journey to Hampi. We drove continuously for another 2.5 h to 3 h before finally reaching Hospet. From here, the journey towards Hampi was a mere 12 km to 13 km. Once we reached our lodgings and refreshed ourselves, the exhaustion gave way to excitement of having finally made it to Hampi. We planned our itinerary based on our proximity to the attractions. Since we were located close to the bus station, we started with attractions that were at a walkable distance. Our first stop was the famous Virupaksha Temple. We were bowled over by the sprawling temple premises, complete with a pond and stone pillars. The temple is well maintained and is quite serene. We then walked over to the Hampi Bazaar, a long shelter with hundreds of pillars on both sides. This is supposedly the same bazaar where once gems and precious stones were sold openly. A little climb further, on a gentle slope, was Hemakuta Hill. It was late evening and the sunset view was breathtaking with the entire area drenched in orange. It soon became a little cold, so we decided to call it a day. On the second day, we ventured out into the city and discovered other modes of transport to explore Hampi like bicycles, auto rickshaws, etc. After enjoying a coracle ride near Virupaksha Temple, we headed to Achutaraya Temple. Similar to Hampi bazaar, the Achutaraya Temple also boasts of a wide and long avenue where once shops were supposed to have lined up on either sides. Thereafter, we went to river Tungabhadra to explore the Purandara Mantapa and the ruined bridge. The bridge was built at a point the river Tungabhadra bifurcates and rejoins. About a kilometre downstream on the river bank is Vijaya Vithala Temple, known for its famous musical pillars and 'the stone chariot'. We decided to camp there for the day in the surrounding greenery. Soon, it was sunset time, and we waited with bated breath, when suddenly brilliant, colourful lights came on. This was one of the premises of the 'Sound & Light' show. As the beams of laser lights changed seamlessly, the majestic stone buildings were brought to life with amazing colours amid collective gasps from the tourists. In the end of it all, we were left spellbound! On the last day of our tour, we started early and headed to Lotus Mahal. One look at it and you know why its called so. Every arch in the Mahal is shaped like the leaves of a lotus. The carvings are beautiful and intricate providing ample play of daylight. This place is a photographer's delight. Not too far from here is the Queen's Bath, a modest building with a tank in the centre. Our last destination was the Elephant Stable. Sprawling greenery and massive, neat columns of stone provide a stunning visual when you first set sight on this monument. It's hard to imagine that elephants were sheltered at a place which seems fit for a king. We later came to know that it was for the king's favourite elephants! What Is the Significance Of The Virupaksha Temple? Throughout the journey, we completely lost track of time. So mesmerized were we by Hampi, the more we explored it, the more it fascinated us with its timeless appeal. But Alas! It was time to bid adieu. With a mix of sadness and satisfaction of finally living my long cherished dream, I headed back home.